Boundless mobility: Free update adds two game modes! Moenchengladbach/Germany, December 17, 2018 – astragon Entertainment GmbH and the stillalive studios developer team are happy to announce the release of the newest update for Bus Simulator 18 today. The update offers not only a new drive mode but also a whole new gameplay mode for virtual bus drivers. With their sixth update for the popular Bus Simulator 18 the team of stillalive studios enhances the game with two new exciting game modes. The Free Roaming drive mode offers players the opportunity to freely cruise around Seaside Valley and explore the different city districts without sticking to routes and timetables. The second great improvement is the Sandbox Mode – one of the most fervent wishes of the Bus Simulator 18 community. In this new game mode, virtual bus drivers will be able to access all city districts and buses right at the start of a new game without having to unlock them by completing a number of missions first. This game mode not only offers more freedom for experienced bus drivers to create their very own public transport company, but also the option to freely test the modding of buses and other community created content. 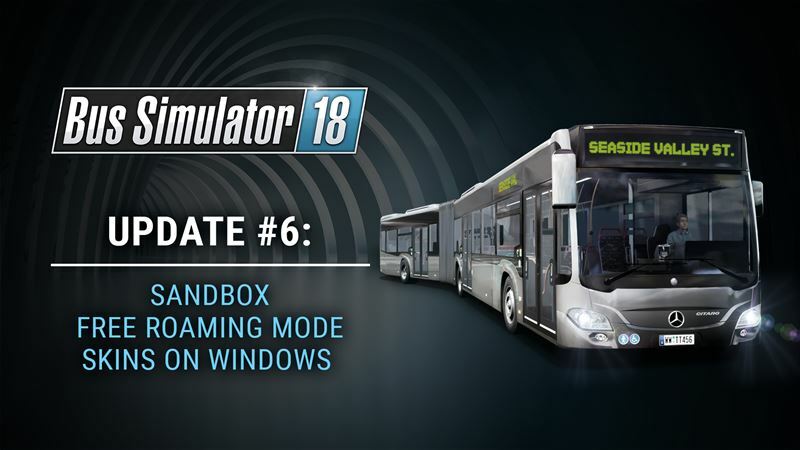 Players already in possession of Bus Simulator 18 are now able to download the Free Roaming & Sandbox Mode Update from Steam™ at no further cost. Players who do not own the main game yet, can buy it in retail or as a digital download for 29.99 Euro, 34.99 USD, 26.99 GBP (RRP). Another addition to the main game is the recently released Mercedes-Benz Interior Pack 1 in form of a DLC on Steam™. This DLC includes brand new and authentic color patterns for seats as well as classy floor designs, which will help to further individualize the game’s Merdedes-Benz Citaro buses. The Mercedes-Benz Interior Pack 1 DLC is available at a price of EUR 1.99 / 2.99 USD / GBP 1.79 (RRP).